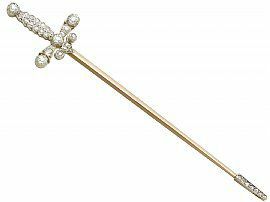 This large and stunning antique Edwardian jabot pin brooch has been crafted in 9 ct yellow gold in the form of a sword. The impressive silver set hilt is embellished with a total of twenty-five Old European round cut diamonds, graduating in size, dependent upon position within the design. Each terminal of the quillon is accented with an individually set Old European round cut diamond. Seven Dutch cut diamonds, ornament the silver set push fit scabbard, which doubles up as a discreet securing clasp. The diamond Jabot pin brooch displays the contemporary engraved inscription 'July 9th 1904' to the reverse. This antique pin-style brooch is supplied with an independent diamond grading report card. This Edwardian brooch has been independently tested using state of the art technology (Niton XL2 Analyzer) and verified as 9 ct gold. This impressive Edwardian brooch is fine quality, set with very high colour graded, old cut diamonds. Total length 12.7cm / 5"
Width across hilt 2.5cm / 0.98"